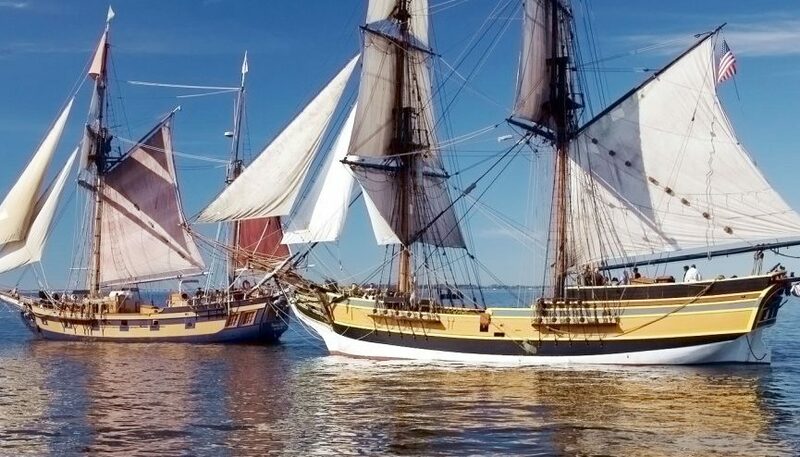 The Hawaiian Chieftain and Lady Washington will be in the bay area from May 5 – May 17, 2016. They will be docked at the Coos Bay Boardwalk. Several events and vendors are planned during their stay here. 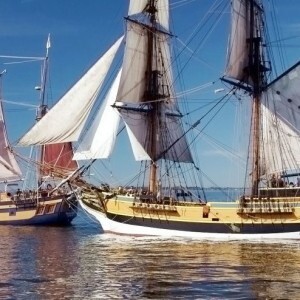 The brig Lady Washington embodies American maritime history of the late 1700s and early 1800s. 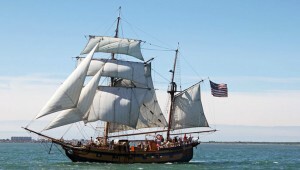 She is a traditionally built replica that has appeared in several movies and television shows. Launched on March 7, 1989, the Lady Washington was built in Aberdeen, Wash., by Grays Harbor Historical Seaport Authority, a 501(c)(3) not-for-profit public development authority. The new Lady Washington is a full-scale replica of the original Lady Washington. In 1787, after the war, she was given a major refit to prepare her for a unprecedented trading voyage around Cape Horn. 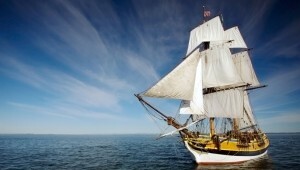 In 1788, she became the first American vessel to make landfall on the west coast of North America. A pioneer in Pan-Pacific trade, she was the first American ship to visit Honolulu, Hong Kong and Japan. Lady Washington opened the black pearl and sandalwood trade between Hawaii and Asia when King Kamehameha became a partner in the ship. The Hawaiian Chieftain has a fascinating history originating in Hawaii. She’s a swift topsail ketch that has visited Tahiti, the Atlantic Ocean, and once sailed out of Sausalito, Calif. Built of steel in Hawaii in 1988 and originally designed for cargo trade among the Hawaiian Islands, naval architect Raymond H. Richards’ design for Hawaiian Chieftain was influenced by the early colonial passenger and coastal packets that traded among Atlantic coastal cities and towns. The coastal packet service was part of the coasting trade based on mercantile activity of the developing seaboard towns. The early packet ships were regular traders and were selected because they sailed remarkably well and could enter small ports with their shallow draft. Out of the gradual development of the Atlantic packet ship hull form came the ship design practices that helped produce some of the best of the clipper ships of the later 1850s. Wine Walk~5:00pm-7:30pm, Downtown Coos Bay. Dress Like a Pirate. Check in at Coos Bay Visitor Information Center for a map and participating businesses and to get your official wine tasting glass for $10. Movie Showing of “Pirates Of The Caribbean,” 7:45pm, Egyptian Theatre. This is a Free Movie night, Sponsored by Coos Bay Boat Building Center and K-Dock Radio. 9:00 am Reconciliation Ceremony with the Lady Washington and Confederated and Coquille Tribes. 10:00 am Proclamation “Coos Bay – Tall Ship Port of Coos Bay” Chamber of Commerce Ribbon Cutting. Movie Night “Pirates of the Caribbean,” Egyptian 7:00 pm. The Historic Egyptian Theatre. This is a Free Movie night, Sponsored by Coos Bay Boat Building Center and K-Dock Radio. Treasure Hunt, 11:00am – 3:00 pm, Downtown Coos Bay. This is a self-guided treasure hunt starting at the Coos Bay Boardwalk. Look for start sign with the first clue. Follow directions to the next clue. Participating businesses will have Treasure Hunt Clues posted visibly in windows with the directions to the next clue. The hunt will end at the Treasure Chest, where you can receive great gifts and prizes donated by local merchants. Coos Bay Boat Building Center Open House, 100 Newmark Avenue, Coos Bay (Empire) 10:00am-2:00pm. 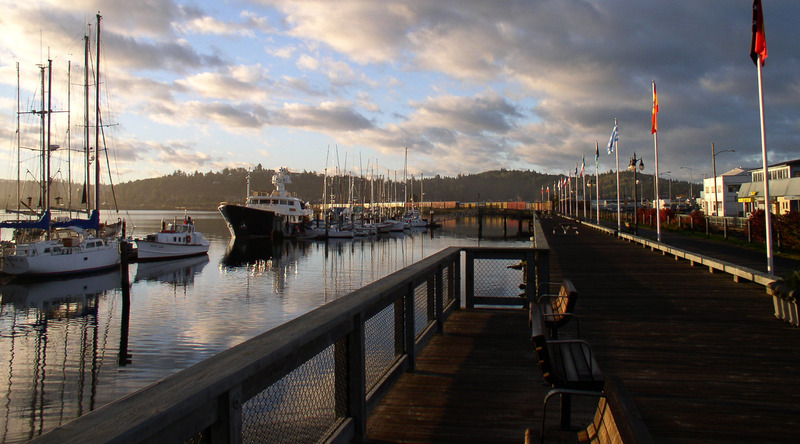 Located on the waterfront adjacent to the Empire Boat Ramp, the Coos Bay Boat Building Center provides educational adventure through participation and small craft heritage. Volunteers are working to preserve the rich history of boat building in the bay area. Visit the Coos Bay Boat Building Center for information. Celtic Festival, 10am – 4pm, Southwestern Oregon Community College. This annual festival celebrates Celtic music, dance and culture. For information visit South Coast Folk Society online. Coos Art Museum, Exhibit: Expressions West 2015. 235 Anderson, Coos Bay. Cost: Donation at the door. 1pm – 4pm. Exhibit features artist from the pacific northwest region and Brian Hoovers “A Feast of Dreams”, South Coast Woodworkers, and Bay Area Artists Association, Visit, Coos Art Museum Online for information. Coos Bay Boat Building Center, Boat Show at the Coos Bay Boardwalk. Giant Inflatable Crab from Oregon Crab Commission. Non-Profit showcases, Vendor Fair, Visitor Information Center Parking lot. GeoCache Event (Find Historic Shipyards on Coos Bay by downloading the GeoCache app on your SmartPhone). This is a fun way to explore the local area and discover hidden treasure from the past. Marshfield Sun Printing Museum,1049 N. Front St. Coos Bay. This historic building at one time housed a working newspaper and print shop from 1891-1944. It has been preserved as it was left in 1944. Located near the historic waterfront. Open for tours 10:00am – 2:00pm. Free Admission. Coos History and Maritime Collection, Visit their website. Coos Bay Boat Building Center Open House,100 Newmark Avenue, Coos Bay (Empire). Located on the waterfront adjacent to the Empire Boat Ramp, the Coos Bay Boat Building Center provides educational adventure through participation and small craft heritage. Volunteers are working to preserve the rich history of boat building in the bay area. Marshfield Sun Printing Museum, 1049 N. Front St. Coos Bay. Open 10am – 2pm. Free Admission. This historic building at one time housed a working newspaper and print shop from 1891-1944. It has been preserved as it was left in 1944. Located near the historic waterfront. Open for tours 10:00am – 2:00pm. Free Admission. Oregon Coast Historical Railway, National Train Week. Take tours, enjoy refreshments, and take a look into Coos County’s logging and train past. Coos Art Museum Exhibit: South Coast Woodworkers & Expressions West,1:00pm – 4:00pm, 235 Anderson, Coos Bay. Exhibit features artist from the pacific northwest region and Brian Hoovers “A Feast of Dreams”, South Coast Woodworkers, and Bay Area Artists Association.